In 2016, the Newport-Mesa Unified School District in southern California began the process of adopting a new math curriculum. Teachers and community members were dissatisfied with the existing program because it wasn’t meeting teachers’ instructional needs or students’ learning needs. Public dissatisfaction made it imperative to involve teachers and the community in the process. We determined that teachers would make the decisions and own both the process and the curriculum, with ongoing support from the district. From the start, we knew that instructional materials matter. Our primary goal was to select high-quality, standards-aligned instructional materials. However, we understood that materials adoption was only one component in reaching our ultimate vision of a K-12 math experience through which all students graduate college- and-career ready, understanding and enjoying mathematics at deep levels. Fulfilling that vision would also mean building a strong foundation to support the implementation of these quality materials with our diverse population of 9,000 K-5 students. High-quality curriculum and high-quality implementation go hand-in-hand. To make this happen, we set out to develop a responsive adoption process that would accomplish more than just the selection of high-quality instructional materials. It would also build teacher and leader capacity to leverage the opportunity to create a coherent K-12 student experience and refine instructional practice. A major element of this approach involved building teachers’ capacity to evaluate and select curricula as part of collaborative teams. We engaged teachers in professional learning about both alignment of curriculum and instructional practices. Teacher learning was built into every part of the process. We hope our approach can support other districts as they embark on adopting new instructional materials — a process that is often difficult and politically charged. 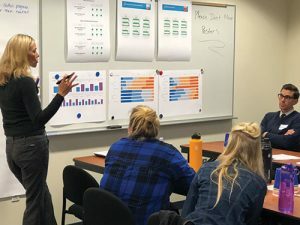 This article outlines our approach and illustrates how incorporating professional learning into the adoption process has positioned our teachers, and ultimately our students, for success. District administrators, who attended trainings and facilitated discussions. Within these groups, we ensured teacher representation of every grade level, every school site, and expertise in working with each student group, including gifted and talented, English language learners, and special education. The adoption process consisted of three main phases, with professional learning infused into each of these phases. In particular, we focused on building understanding of the “why” behind the standards. We had worked with the standards before this adoption effort and recognized the need for everyone to have deep knowledge of the shifts embedded in the standards: focus, coherence, and rigor. Phase 1: Ground the work in shared understanding of the standards. The first step was to develop a shared lens through which to select curricular materials to pilot in classrooms. During the first phase, county and district staff provided professional development on the math standards and shifts, engaging the steering committee in conversations about the intent of the standards and how curricular materials could embody them. This grounding in the standards equipped the committee to analyze impartial third-party evaluations of instructional materials reviewed by EdReports.org. As teams made their way through evaluation reports of several math curricula, we heard teachers reflect about how programs met or didn’t meet the characteristics of high-quality, aligned curriculum, and we saw them begin to winnow choices, until they identified two sets of materials that would be piloted in classrooms: Bridges and GO Math. Phase 2: Apply the learning to two cycles of materials evaluation and selection. Next, we needed to share the learnings of the steering committee with a broader group of teachers who would be piloting the materials. Our focus was now on developing a district tool with which to evaluate the materials. 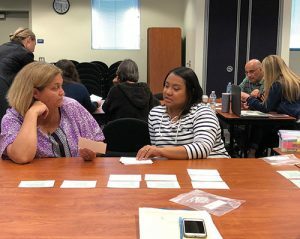 Lead teachers, including members of the steering committee, worked alongside principals to define the indicators of standards alignment, including how standards manifest in lessons, units, grade levels, and assessments. After establishing a preliminary understanding of a key feature of alignment, such as focus, the team developed a list of indicators by which evidence of focus would be determined (see graphic above). Teachers piloted Bridges and GO Math materials in their classrooms with students through seven-week windows, gathering and documenting evidence of alignment to the standards in a weekly survey for each set of materials. Throughout the pilot, county and district leaders analyzed data from the weekly survey to understand how pilot teachers interpreted the alignment indicators and to determine the strength of the evidence. This data analysis honed the shared understanding about what constitutes quality evidence and directly contributed to strengthening the caliber of the evidence gathered. At the close of the first analysis, teachers indicated that their learning had deepened so much that they wanted to revisit their own evidence and revise it. In response to this feedback, district personnel built in time for more analysis, reflection, and revision during the second round of evaluation. Phase 3: Build consensus. The emphasis on careful analysis of the review criteria during the previous stage ensured that the steering and pilot committees arrived prepared on consensus day. Having clear priorities in the review tool and throughout the professional development sessions shifted the conversation away from individual classroom concerns and toward big questions such as which program has the content and design that would best meet students’ academic needs. At one point during the consensus process, committee members physically represented their vote by standing along an imaginary line, with Program A on one endpoint and Program B on the other. The group was split nearly 50-50. After assembling a list of strengths and concerns about each program, the facilitator invited committee members to consider the knowledge they had developed throughout the adoption process. He asked them to take a stand for the program they felt would best support students. As teachers reflected on their learning throughout the year, the line began to move toward one of the programs. With student needs front and center, the consensus conversation shifted to a discussion about the moral imperative of what’s best for kids, even if it means choosing a program that demands greater cognitive load for teachers. Complete the math of the post-unit assessment by taking it as if they were students, allowing teachers to understand explicitly what students would need to know, understand, and be able to do. Identify concepts, representations, and strategies. Engage in each game within the unit. The district, county, and teaching staff learn from each other in these Moonlight Sessions. We learn from the reflections of the participating teachers, and it helps to plan site-specific and ongoing support for the next units and next years. We know that this intentionality is leading to higher-quality implementation because teachers are studying the material in a deeper way and can make pedagogical moves and adjustments with knowledge of how these may affect the goals of the lesson or unit. Teachers are also sharing positive feedback such as, “Discussing the main standards addressed in Unit 4 as well as how these standards are presented to the students [was helpful]. It was great to start the session looking at the unit test and figuring out how to get students to develop those math skills.” We are now turning our attention to better understanding of how participation is impacting teacher practice and, more importantly, student learning. We are already planning the second year of Moonlight Sessions, considering how we can increase attendance at these sessions and use them to further develop teacher content knowledge, pedagogical knowledge, and knowledge of student thinking. We have learned a lot about professional learning and instructional materials through this process and are confident that other districts can experience similar success. Our top recommendations are: Respect, trust, and elevate teacher voice. Teacher ownership contributes to a successful rollout and stronger implementation of the materials, particularly because teacher advocates can speak knowledgeably about the program and why it supports students. Remember that the adoption and implementation process is about the students. Most of the conversations about materials end up being about the adults buying and teaching the curriculum. We recommend flipping this conversation to be about what students deserve: How will these materials support student learning? What professional development or resources will we need to ensure our students receive the very best? Prioritize what matters most. Not all aspects of high-quality materials are of equal importance. Our materials and instruction must represent the shifts and standards our students need to be college- and career-ready. We weighted alignment more heavily in our rubric and in professional learning sessions than characteristics such as online features. Prioritize the quality of the content itself. Not only will this support your material selection, it will help you to align the professional learning that is required to improve instruction. Structure your decision-making and plan for consensus-building early. For us, this meant supporting our team through consensus-building exercises. A simple up/down vote would not value the depth of the work and learning of the team, potentially leading to a lack of ownership around the final decision. Our consensus process included multiple rounds of evidence analysis and ultimately led to a decision that all committee members could advocate for back at their schools. Plan for and model responsive professional learning. Learning Forward states that “professional learning must engage each educator in timely, high-quality learning that meets his or her particular learning needs” (Learning Forward, n.d.). Throughout this work, we realized that we needed to adjust our plan to best reach our steering committee and piloting teachers. This included slowing down, revisiting topics, and identifying new areas of learning from the data we collected. We see the impact of this deeper learning in the program that was selected and the further development of teachers’ pedagogy.